Department of Nutrition and Dietetics, Harokopio University of Athens, 70 El. Venizelou Str., 17671 Kallithea-Athens, Greece. Diabetes mellitus is widely recognized as one of the leading causes of death and disability. While insulin insensitivity is an early phenomenon partly related to obesity, pancreatic β-cell function declines gradually over time even before the onset of clinical hyperglycemia. Several mechanisms have been proposed to be responsible for insulin resistance, including increased non-esterified fatty acids, inflammatory cytokines, adipokines, and mitochondrial dysfunction, as well as glucotoxicity, lipotoxicity, and amyloid formation for β-cell dysfunction. Moreover, the disease has a strong genetic component, although only a handful of genes have been identified so far. Diabetic management includes diet, exercise and combinations of antihyperglycemic drug treatment with lipid-lowering, antihypertensive, and antiplatelet therapy. Since many persons with type 2 diabetes are insulin resistant and overweight, nutrition therapy often begins with lifestyle strategies to reduce energy intake and increase energy expenditure through physical activity. These strategies should be implemented as soon as diabetes or impaired glucose homoeostasis (pre-diabetes) is diagnosed. Diabetes mellitus has been widely recognized to be a fundamental and leading cause of major health issues, in particular of all the cardiovascular diseases. It affects more than 170 million individuals worldwide. There is ample evidence indicating that by 2010, a further growth will occur, mainly caused by dramatic increases in the developing countries of Africa, Asia, and South America . In type 2 diabetes mellitus (T2DM), lifestyle factors, in particular those related to obesity , contribute to its development. In industrialized countries, a rapid increase in fat, saturated fatty acid and energy intake accompanies a decrease in physical activity, in the consumption of dietary fiber and of diets with low glycemic index. To date, this development has resulted in a 6% prevalence of T2DM in these populations , 4% of whom are obese white adolescents. Furthermore, a prevalence of 25% abnormal glucose tolerance must be reported . Diet and obesity are the main factors affecting the prevalence as well as the development and severity of T2DM. The present paper therefore focuses on dietary and genetic aspects in T2DM in relation to preventing the condition. According to WHO recommendations (1999), the diagnosis of diabetes incorporates both fasting and 2-h post-glucose load (75 g) glucose concentrations . Impaired glucose tolerance carries an increased risk of macrovascular disease . 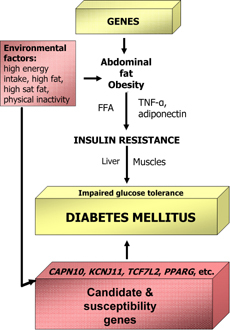 Insulin resistance is strongly associated with obesity and physical inactivity. A number of circulating hormones, cytokines, and metabolic fuels, such as non-esterified (free) fatty acids (NEFA), originate in the adipocyte and modulate insulin action. An increased mass of stored triglyceride, especially in visceral or deep subcutaneous adipose depots, leads to large adipocytes that are themselves resistant to the ability of insulin to suppress lipolysis. This results in increased release and circulating levels of NEFA and glycerol, both of which aggravate insulin resistance in skeletal muscle and the liver . A number of nationwide studies exist on the heritability of diabetes, which show that T2DM, where both genetic and environmental effects play a significant role, tends to run in families. Thus, the risk for T2DM is increased when there is a positive family history of the disease. Approximately 15-25% of the first-degree relatives of patients with T2DM develop either impaired glucose tolerance or diabetes . 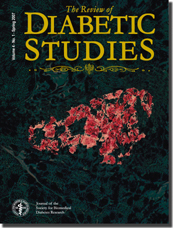 When the prevalence of diabetes and glucose intolerance was studied, both cross-sectionally and longitudinally, in a cohort of 199 offspring of conjugal diabetic parents, the occurrence of T2DM was estimated to approach 60% by the age of 60 years . The concordance rate for diabetes has been shown to differ among twin pairs. Thus, it ranges between 35% and 58% among monozygotic twins, rising to 88% when impaired glucose tolerance is included , and is 17% to 20% among dizygotic twins [11, 12]. Nutrition management is a key component in the long-term health and quality of life of people with T2DM.The general nutrition principles and recommendations are the same for people with diabetes as for those without the condition. However, it is important to set realistic goals that are in tune with the individual's micro- and macronutrient, physical activity, lifestyle and medical needs. The overall goal of diabetes management is to help individuals and their families gain the necessary knowledge, life skills, resources and support needed to achieve optimum health. Nutritional management seeks to improve or maintain the quality of life, physiological health and nutritional status of people with diabetes, by recognizing that their micro- and macronutrient requirements are similar to those of the general population. The goal of diabetes management is to keep blood glucose levels as close to a normal range as safely possible, while avoiding blood glucose levels that are too high (hyperglycemia) or too low (hypoglycemia) . Attention to food portions and weight management, combined with physical activity, helps improve glycemic control. General guidelines include 50-60% of daily energy requirements derived from carbohydrates, low glycemic index foods, foods containing cereal fiber and a protein intake of least 0.86 g/kg/day. The consumption of added sugars can be up to 10% of daily energy requirements. Also, guidelines recommend the limited intake of total fat, especially saturated fats, with monounsaturated fatty acid (MUFA) used where possible, appropriate use of nutritive and non-nutritive sweeteners, the daily vitamin and mineral requirements of a well balanced diet and individualized physical activity for people with T2DM. The ongoing efforts to understand the relationships between the genome and diet, termed nutrigenetics and nutrigenomics, have currently modified the definition of T2DM management. Both disciplines aim to unravel diet/genome interactions and identify the optimal diet for individuals, either by clarifying how the genetic makeup of an individual coordinates response to diet , or by relating different phenotypes to differences in cellular and/or genetic response (Figure 1). Figure 1. Simplified model of factors affecting the development of type 2 diabtes. The candidate gene approach results in the identification of the gene variants that influence disease. If studies clearly show that a variant has a significant effect on disease-related phenotypes, then this is described as a susceptibility gene. Meta-analyses provide convincing support for the involvement of a gene variant in disease risk. The most compelling evidence generated from a meta-analysis of multiple published studies, results in the determination of the susceptibility genes from among the candidate genes. However, researchers should always consider that if a disease is heterogeneous and polygenic, such as T2DM, studies of single gene variants may not be conclusive and consistent with one another. The contribution of a gene variant to disease and related phenotype is more certain when it is the result of gene-gene interaction studies. Variants in many candidate genes for T2DM have been extensively studied over the past two decades. Such genes are the KCNJ11, which encodes Kir6.2, the TCF7L2, the Gly972Arg polymorphism in IRS1, the Gly1057Asp polymorphism in IRS2, the Trp64Arg polymorphism in the gene encoding the β3 adrenergic receptor and the -308 G/A promoter variant in TNF (Figure 2). In most instances the initial association was not replicated in subsequent analyses. Even if the adiponectin gene variants do not definitely confer susceptibility for T2DM, they are nevertheless candidate genes. Figure 2. Interrelation between genes and environmental factors in type 2 diabetes. Genes in combination with environmental factors may lead to obesity, insulin resistance and finally diabetes. Environmental factors may also act in concert together with diabetes candidate and susceptibility genes to trigger the pathogenesis of type 2 diabetes directly. The first "common diabetes gene" cloned in this way was CAPN10 in the NIDDM1 region of chromosome 2 [15, 16]. It encodes for calpain-10, a cysteine protease which is ubiquitously expressed [17, 18]. Originally, the G allele of a non-coding single nucleotide polymorphism (UCSNP-43) was associated with T2DM. The risk of developing T2DM, however, is not fully attributable to a single polymorphism of the gene encoding calpain 10, but, as was described in a Mexican-American population, results from the combination of haplotypes created by alleles of three single nucleotide polymorphisms (SNPs): SNP-43, SNP-19, and SNP-63 . All these three SNPs are located within introns and are highly likely to influence gene expression. In later studies, this finding could not be replicated [19, 20], but another SNP (UCSNP-44) was found to be associated with T2DM [21, 22]. Genetic variants in the gene encoding calpain-10 might affect insulin sensitivity,  or insulin secretion,  or the relation between the two . Pancreatic β-cell ATP-sensitive K+ channels (KATP channels) are crucial for the regulation of insulin secretion by coupling cell metabolism to membrane electrical activity. The pancreatic β-cell KATP channel comprises two subunits, the inwardly rectifying potassium channel, Kir6.2 (encoded by KCNJ11), and the sulfonylurea receptor, SUR1 (encoded by ABCC8) . The ABCC8 and KCNJ11 genes are located on chromosome 11p15.1 and several gene variants of both genes have been associated with disorders of insulin secretion and T2DM [27, 28]. The strongest statistical association with T2DM in KCNJ11 is with SNPs 74 (3p+215), 76 (A190) and 77 (E23K). However, the evidence suggests a predominant role for the amino acid variant E23K in T2DM susceptibility . Grant et al. have identified TCF7L2 as a novel susceptibility gene for T2DM and reported an association with the microsatellite marker DG10S478 within intron 3. The associated tetranucleotid repeat was shown to have six alleles, namely alleles 0, 4, 8, 12, 16 and 20. The combined non-zero alleles of DG10S478 (referred to as X) were associated with an increased risk in three independent populations (Danish, Icelandic and US). The composite at-risk allele X was almost perfectly correlated with the T allele of the SNP rs12255372, while the G allele was linked to allele 0. Consequently, the rs12255372 T allele showed an association with T2DM as well . This association was detected in the course of positional cloning efforts in a region of chromosome 10q previously linked to diabetes in Icelandic pedigrees  and confirmed in case-control analyses of Danish and U.S. cohorts. Quite recently, the hypothesis that TCF7L2 is a genuine T2DM susceptibility gene was confirmed . Unraveling the mechanisms whereby changes in the function or regulation of this transcription factor lead to loss of β-cell performance and/or insulin sensitivity is likely to provide crucial new insights into disease pathogenesis. Adipose tissue-derived cytokines, TNF-α and IL-6, could be involved in the development of diabetes through several mechanisms. Elevated levels of these cytokines have been linked to the risk for diabetes [32-34]. Genes encoding proteins critical in pancreatic β-cell function are particularly good candidate genes for T2DM. Studies of maturity-onset diabetes in the young in humans  and knockout mice  have shown that mutations in the transcription factors required for the development, differentiation, and maintenance of the pancreatic β-cells can cause diabetes. EIF4A2, the gene encoding eukaryotic translation initiation factor 4α2, an ubiquitous RNA helicase involved in protein translation initiation, is down-regulated in rat β-INS832/13 cells exposed to high-glucose concentrations. Thus, EIF4A2 may contribute to the regulation of insulin production in response to glucose. Cheyssac et al. recently reported that a SNP in this gene was significantly associated with T2DM diagnosed 45 years ago and with the age of onset in French families. Hepatocyte nuclear factor (HNF)-4α is a transcription factor known as a key molecule in β-cell development and function. In a previously performed genome-wide scan of Japanese type 2 diabetic sibpairs, researchers observed linkage of T2DM to chromosome 20q12-q13, a region in which the HNF4A gene is located . Recent studies report associations between T2DM and polymorphisms in the P2 promoter region specific to β-cells [39-41]. The ubiquitously expressed protein tyrosine phosphatase-1B (PTP1B), encoded by the PTPN1 gene, catalyzes the dephosphorylation of tyrosine residues from the insulin receptor kinase activation segment  and IRS1  resulting in the down-regulation of insulin signaling. PTP1B also inhibits leptin signaling through the dephosphorylation of JAK2 and STAT3 [44, 45]. The disruption of the PTPN1 gene in mice results in increased insulin sensitivity, and in resistance to diet-induced obesity , as well as enabling normalization of blood glucose levels . Several studies have investigated the association of T2DM with genetic variants of PTPN1. When analyzing the PTPN1 gene locus, Bento et al. found convincing associations between multiple SNPs and T2DM in two independent Caucasian American case-control samples. Recently published data indicate that PTPN1 variants might modify the lipid profile, thereby influencing susceptibility to the metabolic syndrome . PPARγ is encoded by PPARG, and is a transcription factor that is activated by certain fatty acids, prostanoids, and thiazolidinediones [50, 51]. PPARγ1 is expressed in most tissues, while PPARγ2 is specific to adipose tissue, where it regulates adipogenic differentiation . The high risk proline allele of the Pro12Ala PPARγ polymorphism has a prevalence of 75% in white people. Two meta-analyses and a large prospective analysis have shown a risk reduction of 21-27% for the alanine allele [53-55]. The alanine genotype presumably results in greater insulin sensitivity [56-58]. The proline variant has lower transcriptional activity and heterozygous PPARγ knockout mice are more insulin resistant. Since PPARγ2 is exclusively expressed in adipose tissue, a primary mechanism in this tissue with a secondary effect on hepatic insulin sensitivity and insulin clearance can be invoked . C1431T silent substitution in the 6th exon of PPARG is the polymorphism that modulates the effect of Pro12Ala on susceptibility to T2DM . The PPARG Pro12Ala polymorphism has been shown to be protective against mild fasting hyperglycemia and T2DM during a 6-year follow-up in subjects who were normoglycemic at baseline . The PPARG exon 6 C1431T SNP was also associated with a lower risk. A significant interaction has also been described for the PPARα Leu162Val polymorphism and n-6 polyunsaturated fatty acid (PUFA) intake. In persons with the less common V162 allele, increased n-6 PUFA intake is associated with a marked reduction in triacylglycerol concentration, whereas this association is not observed in L162 carriers . Adiponectin levels correlate negatively with glucose, insulin and triglyceride levels as well as the body mass index (BMI), while there is a positive correlation with high-density lipoproteins (HDL), cholesterol levels and insulin-stimulated glucose disposal [63, 64]. Furthermore, high plasma adiponectin concentration protects against T2DM . The adiponectin/ACDC gene is located on chromosome 3q27 at a locus linked to T2DM and also to several phenotypes related to features of the metabolic syndrome [66, 67]. SNPs of APM1, the gene encoding adiponectin, were associated with the development of hyperglycemia . Both case-control and prospective studies in general populations have shown that inherited variations at the ACDC locus modulate adiponectin levels and insulin sensitivity and are part of the genetic background of T2DM [69-72]. Together with animal studies, genetic epidemiology approaches suggest a causative contribution on the part of adiponectin signaling for obesity-associated insulin resistance and T2DM. Two putative adiponectin receptors, adiponectin receptor 1 (AdipoR1) and adiponectin receptor 1 (AdipoR2), have been cloned . Both receptors are significantly expressed in liver, muscle, and adipose tissue. Their expression levels in muscle correlate with distinct metabolic parameters, particularly with first-phase insulin secretion for AdipoR1 , but their relation with insulin sensitivity is not completely established. Expression of both receptors is lower in normal glucose tolerant subjects with a family history of diabetes . Recently, the absence of contributions from ADIPOR1 SNPs in the genetic risk for T2DM was reported . Nutrition recommendations for the general population are also appropriate for persons with T2DM. Because many persons with T2DM are overweight and insulin resistant, medical nutrition therapy should emphasize lifestyle changes that result in reduced energy intake and increased energy expenditure through physical activity. Many people with diabetes are also diagnosed with dyslipidemia and hypertension, making reductions in dietary intake of saturated fat, cholesterol, and sodium desirable. Therefore, the emphasis of nutrition therapy for T2DM is given to lifestyle strategies to reduce glycemia, dyslipidemia and blood pressure. These strategies should be implemented as soon as the diagnosis of diabetes is made. High-fat feeding has been presumed to be a cause of obesity and insulin resistance for at least twenty years . However, the concept that "oils ain't oils"  slowly started emerging in the latter half of the eighties and it is now well established that the fatty acid profile of a dietary fat has far-reaching differential regulatory consequences in the human body. High saturated fat content of the membrane makes for rigid, unresponsive membranes, whereas increased desaturation makes for improved membrane fluidity and responsiveness . Diets containing tallow (predominantly saturated fat), olive oil (mainly mono-unsaturated), sunflower oil (largely omega-6) and fish oil (omega-3-rich) are commonly administered to animals when investigating the effect of dietary fat on insulin resistance and obesity. In animal studies, an impressive body of evidence has established the connection between dietary lipids, membrane lipid profiles and insulin resistance [80-82]. A pioneering study performed by Storlien and coworkers in 1987  showed that only by replacing sunflower oil (omega(n)-6) with fish oil (n-3) in rats fed on a high sucrose and high fat diet, was the development of insulin resistance attenuated. In humans, the obesity and T2DM-prone Pima population proved to have 40% lower n-3 levels in their muscle membrane lipids than Australians [83, 84]. Kopecky and coworkers have shown that impairment of the mitochondrial uncoupling protein (UCP) system can lead to obesity and thus to insulin resistance. UCP synthesis is regulated by the PPARγ transcription factor family, which, in turn, can be regulated by fatty acids . Recent studies have supported the concept that polyunsaturated fatty acids can act as ligands of PPARγ [86, 87] or can modulate its expression, thus increasing GLUT4 transcription [88, 89] and synthesis and improving insulin resistance. Certain polyunsaturated fatty acids, but not saturated fatty acids, can be converted to eicosanoids by cyclooxygenase. For example, AA (omega-6) can be changed to the highly inflammatory prostaglandins of the -2 series, whereas EPA (omega-3) can be converted to the anti-inflammatory prostaglandins of the -3 series. DHA (omega-3) cannot be converted to a prostaglandin, but retroconversion to EPA, and hence formation of series -3 prostaglandins, is possible . Although eicosanoids are implicated in the regulation of GLUT4 trafficking and insulin-stimulated glucose transport , Nugent et al. report a cyclooxygenase-independent stimulatory effect of AA on glucose uptake . An interaction between the intake of MUFA, BMI and the Pro12Ala polymorphism of the PPARγ2 gene has recently been reported . It is suggested that an interaction exists between Pro12Ala polymorphism of PPARγ2 and dietary MUFA, which means that obese people with the Ala-12 allele have higher homeostasis model assessment (HOMA) insulin resistance (IR) values, especially if MUFA intake is low . Another gene implicated in gene-diet interaction in diabetes is Rad. It is a prototypic member of the RGK family of Ras-related GTPases, which also includes Gem/Kir, Rem, and Rem2 [95, 96]. Rad was originally found to be overexpressed in the skeletal muscle of a patient with T2DM using subtraction cloning . Ilany et al. have generated transgenic (tg) mice that overexpress Rad in muscle . Rad-Tg mice exhibit normal growth and development, as well as normal glucose homeostasis and insulin sensitivity, as measured by fasting and fed glucose and insulin levels and glucose and insulin tolerance testing. However, when fed a high-fat diet, Rad-Tg mice became more insulin resistant and glucose intolerant than normal mice on the same diet. The combination of high-fat diet and Rad overexpression caused more severely diminished insulin-stimulated glucose uptake than high-fat diet alone, even though Rad overexpression alone did not change glucose transport. Thus, Rad overexpression interacts with a high-fat diet to worsen insulin resistance in muscle. This finding was consistent with clinical studies suggesting that Rad may interact with obesity in increasing diabetes risk  and is an example of how a genetic factor (Rad overexpression) can act together with an environmental factor (high-fat diet and obesity) to alter glucose homeostasis. Perilipin, which is encoded by PLIN, is the predominant protein associated with lipid storage droplets in adipocytes and one of the critical regulators implicated in lipid mobilization [99, 100]. The connection between perilipin, body fat, and insulin resistance has been demonstrated in knockout mouse models, which displayed reduced body fat and, paradoxically, an increased risk of glucose intolerance and peripheral insulin resistance . Dietary factors play a role in the relationship between perilipin and body weight. PLIN polymorphism modulates weight loss in response to a low-energy diet . Genetic variation at the PLIN locus modulates the effects of habitual dietary fat and carbohydrate consumption on insulin resistance in a large sample of an Asian female general population. A statistically significant gene-diet interaction was found between intake of fat and carbohydrate and polymorphisms in PLIN (11482GA and 14995AT) . SCARB1 genetic variability plays a significant role in lipoprotein metabolism in humans [103, 104]. Recent findings show that the presence of the A allele at the SCARB1 exon 1 polymorphism is associated with a statistically significant increase in insulin sensitivity after the consumption of a MUFA-rich diet compared to the effect on G/G individuals . The fatty acid (FA)-binding protein 2 (FABP2) gene codes for intestinal FABP (IFABP), which is a member of a family of small (14-15-kDa) intracellular lipid-binding proteins. The gene located at 4q28-q31 has the conserved 4 exons and 3 introns that are characteristic of this family of genes [106, 107]. IFABP is crucial for fat absorption and transport: the uptake and trafficking of saturated and unsaturated long-chain fatty acids (LCFAs), the targeting of free fatty acids (FFAs) toward different metabolic pathways, protection of the cytosol from the cytotoxic effects of FFAs and the modulation of the enzyme additive involved in lipid metabolism [108, 109]. Besides FFAs, IFABP may bind other ligands such as phenolic antioxidants. It is abundant in the enterocyte, representing 2-3% of the cytoplasmic mass of those cells . It has been found that the expression of IFABP mRNA is under dietary control . Subjects with the Thr54 allele had higher FFA concentrations than did those who were homozygous for the Ala54 allele when consuming a saturated fatty acid (SFA)-rich diet . Considering the hypothesis proposed by Baier et al. , this suggests a plausible mechanism for the FABP2 Ala54/Thr54 polymorphism-diet interaction for the determination of insulin sensitivity. Thus, the presence of the FABP2 gene Ala54/Thr54 polymorphism impairs peripheral insulin sensitivity when the carriers consume an SFA diet. The importance of preventing diabetes in high-risk individuals is highlighted by the substantial and worldwide increase in the prevalence of diabetes in recent years. Genetic susceptibility appears to play a powerful role in the occurrence of T2DM in certain populations. However, given that population gene pools shift quite slowly, the current epidemic most likely reflects marked changes in lifestyle. Lifestyle changes that are characterized by decreased physical activity and increased energy consumption have combined to promote obesity, a strong risk factor for diabetes that is influenced itself by both genes and behavior (Figure 2). Despite the difficulty in maintaining a reduced body weight long-term, several studies have demonstrated that there is potential for moderate sustained weight loss in order to substantially reduce the risk for T2DM. Reduced intake of total fat, particularly saturated fat, may reduce risk for diabetes. Increased diabetes incidence is reported with increased intake of dietary fat, independent of total calories, although this effect is not demonstrated in all studies. The importance of a balanced ratio of omega-6 to omega-3 intake, as in the ancient Paleolithic diet, was recently tested in the Lyon Heart Study . This study was a prospective, randomized, single-blinded secondary prevention trial, which compared the effects of a modified Cretan diet, enriched with alpha-linolenic acid (ALA; ratio of omega-6/3, 4:1), low in saturated fat, very low in trans fat and high in vitamin C and E, to that of a Step I American Heart Association Diet in the secondary prevention of coronary events and death. It would appear to be prudent to return to the hunter-gatherer diet of our ancestors or the suggested Mediterranean (Crete) type diet [114, 115] that contains less saturated and trans-fatty acids and more polyunsaturated fatty acids with an improved omega-6/omega-3 ratio . Studies in healthy subjects suggest that diets based on olive oil, as opposed to diets rich in SFA or PUFA, have beneficial effects on atherogenic factors linked to inflammation of the vascular wall, such as monocyte chemotaxis and adhesion to endothelial cells and expression of adhesion molecules [116, 117]. In this regard, treatment of endothelial cells with oleic acid protected them against cytokine-induced adhesion molecule overexpression . Moderate reductions in dietary sodium intake (2400 mg/day) decreased blood pressure by 5 mm Hg systolic and 2 mm Hg diastolic in hypertensive patients and by 3 mm Hg systolic and 1 mm Hg diastolic in normotensive patients . Although there is a wide variation in blood pressure responses, the lower the sodium intake, the greater the lowering of blood pressure . Responses to sodium reduction may be greater in subjects who are "salt sensitive", a characteristic of many individuals with diabetes . The so-called prudent dietary pattern, characterized by a high intake of vegetables, legumes, fruit, and whole grains and a low intake of red meat, processed meat, high-fat dairy products, and refined grains is increasingly favored for a beneficial effect on a number of health outcomes, including diabetes treatment and prevention. The prudent diet does not necessarily have to be a low-fat one. A variety of vegetable foods rich in MUFA that are good sources of antioxidants, such as high-oleic acid oils and nuts, can be incorporated into this dietary pattern to increase palatability and compliance, with a high chance of health benefits. Together with a healthy diet, unraveling the plethora of diabetes-predisposing genes and elucidation of their interactions with the dietary products (Table 1) will probably reduce the incidence of T2DM and improve the outcome of the disease. Legend: MUFA: monounsaturated fatty acid. HOMA: homeostasis model assessment. IR: insulin resistance. SFA: saturated fatty acid. FFA: free fatty acids. T2DM: type 2 diabetes mellitus. OR: odds ratio. CI: confidence interval.